The SHSU Student Health Center will administer the seasonal influenza vaccine free of charge to faculty and staff members on Tuesday (Oct. 9) and Wednesday (Oct. 10). Vaccinations will be dispensed from 9 a.m. to 4 p.m. on both days in Lowman Student Center Room 320. Faculty and staff are asked to come prepared with sleeves that can be easily adjusted to expose their shoulder in order to speed the administration process. There will be an area to disrobe with privacy screens, but an easily accessible injection site will make the process faster and more comfortable, Hanel said. Employees who miss the flu vaccine administration dates will not be accommodated and will be advised to obtain the vaccine through other means. Sam Houston State University faculty will offer tips on how to get into law or graduate school on Tuesday (Oct. 9) during the next Real Talk with CJ. Kelly Knight, an assistant professor of criminal justice, and Mike Yawn, pre-law adviser at SHSU, will provide an overview, at 3 p.m. in the CJava Café, on what students need to know to pursue advanced degrees following one of three routes: law school, academic research, and teaching or professional advancement. “These types of sessions are a must-do for students who plan to go on to graduate-level education to get a head start in the foot race,” Yawn said. Knight will discuss the process of getting into graduate school, including researching programs and topics of study, working with undergraduate professors, taking the GRE, formulating a personal essay and compiling test scores, writing samples and grades. Yawn hopes to clear up some misconceptions about law school and identify the criteria that law schools use for admittance, such as LSAT scores, grades, letters of recommendations, and personal essays. He will identify a timeline for actions in the process and discuss realistic expectations for employment in the field. Knight said because graduate studies are expensive, require a lot of hard work and produce lots of stress, the decision to attend graduate school should not be taken lightly. If those things don’t deter you, Yawn said it’s never to early to start planning for your post-graduate life. For more information on Real Talk with CJ, contact College of Criminal Justice publications coordinator Beth Kuhles at 936.294.4425. Luis Alvarado, an archeologist with the Texas Parks and Wildlife Department, will discuss his work on the Devils River State Natural Area, near Del Rio, on Wednesday (Oct. 10). The Texas Archeology Month event will begin with a reception at 6:30 p.m., followed by Alvarado’s presentation at 7 p.m. in the Katy and E. Don Walker, Sr., Education Center. Alvarado will share details on the recent survey completed at Devils River State Natural Area, a 17,000-acre plot of land newly acquired by the TPWD. Alvarado has been working in archeology in Texas for more than 15 years and has been a member of the Texas Parks and Wildlife Department Archeology Survey Team for the last 10 years. He earned his Bachelor of Arts degree in anthropology from Texas Tech University and his Master of Arts degree in anthropology from Texas State University-San Marcos. His research interests include prehistoric archeology of Texas with a specific interest in the late prehistoric period of the Texas southern plains and West Texas. Alvarado’s lecture is free and open to the public. Texas Archeology Month is held each October to celebrate a spirit of discovery and allow Texans to understand the historical significance of the state's archeological sites, the importance of proper archeological practices, and contributions of professional and avocational archeologists. For more information, contact Megan Buro, Sam Houston Memorial Museum marketing coordinator, at 936.294.3839 or mlb044@shsu.edu. Steve Thompson, Recreational Sports department associate director of programs, will share some of the “seemingly insignificant decisions” people have to make in their lives on Monday (Oct. 8), during the Honors 3332 Journeys Seminar lecture. Thompson’s discussion of “A Life Less Ordinary” will begin at 4 p.m. in the Smith-Hutson Building’s Haney Auditorium, Room 186. Thompson has been with the SHSU Department of Recreational Sports since January 2006. A Pittsburgh native, he earned his bachelor’s and master’s degrees from Edinboro University of Pennsylvania and is currently working on his doctorate at SHSU. Thompson has worked in the recreation field, primarily adventure recreation, for 20 years. He is a wilderness first responder, former president of the Association of Outdoor Recreation and Education, and has instructed and guided a wide variety of outdoor pursuits, including climbing, skiing, white water boating, mountain biking, low-impact camping, mountaineering, sailing, canyoneering, and extended backpacking. Sam Houston State University faculty pianist Ilonka Rus will perform a variety of classical pieces with friends from the Houston Symphony on Monday (Oct 8). The chamber recital, part of the School of Music’s guest artist series, will begin at 7:30 p.m. in the Gaertner Performing Arts Center Recital Hall and will include works by modern composer Ann Karen Gebuhr, as well as Ludwig van Beethoven, and Robert Schumann. The Houston Symphony performers joining Rus include violinists Rodica Oancea-Gonzalez and Mihaela Oancea-Frusina; violist Wei Jiang; and cellist Jeffrey Butler. “They are elite players, and the recital program is well worth coming to listen to,” said Rus, assistant professor of piano. While on campus, three of the musicians will offer master classes for students, beginning at 4 p.m. They include a violin master class with Gonzalez and viola master class with Jiang in the Concert Hall and a cello master class with Butler in Music Building Room 202. A Transylvanian born pianist, Rus has been performing with Gonzalez and Frusina since 2007 when the three formed a trio. In 2014, Rus will perform with the two for her second Carnegie Hall concert. She began studying piano at the age of five and won her first international piano competition at the age of 10 in Italy. She has also studied at the Music Academy in Bucharest, Romania; Texas Christian University; Oberlin Conservatory; and the University of Houston, where she was awarded a Fulbright scholarship and received her Doctor of Musical Arts degree. 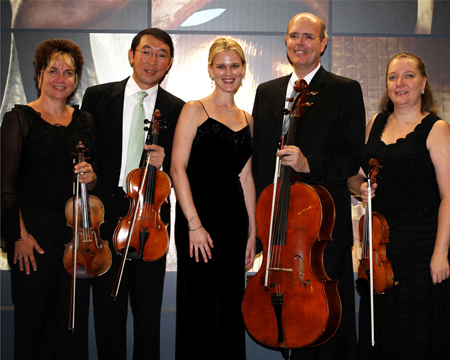 Joining her are four international musicians who have been with the Houston Symphony for several years. Gonzalez was born in Bucharest, Romania, and studied at Ciprian Porumbescu Conservatory in Bucharest and Rice University. She is currently a member of the first violin section of the Houston Symphony, with which she has appeared as a soloist twice, and is also the founding violinist of the Tre Voci Trio and the Fidelis Quartet. Frusina also was born in Bucharest, and earned her bachelor’s and master’s degrees in violin performance from Rice University. She is currently a member of the Houston Symphony and has been teaching privately for the past 14 years. Born in China, Jiang studied music at the Central Conservatory of Music in Beijing, the Oberlin Conservatory and the University of Maryland. In 1999 he became a member of the Houston Symphony. Butler, who has been a cellist in the Houston Symphony since 1986, holds degrees in music performance from Boston University and the University of Michigan School of Music, where he was recipient of that school’s highest award, the prestigious Stanley Medal. Concert tickets are $15 for general admission, $12 for senior citizens, and $5 for SHSU students. The master classes are free and open to the public. The Student Money Management Center will evaluate “The American Dream” by exploring the financial and legal aspects of starting a business on Tuesday (Oct. 9). The fall 2012 workshop will be from 3:30-4:20 p.m. in Lowman Student Center Room 315. Led by SMMC peer counselors Jacob Brock and Erik Johnson and Student Legal Services director Rhonda Beassie, the presentation is designed for students who are interested in being self-employed upon graduation or pursuing their own small business. “This event will affect SHSU students who want to be their own boss someday,” Johnson said. “We do have a number of students who are curious about the process of starting their own business at least at some point in their life. Snacks and drinks will be provided during the presentation. Representatives from approximately 45 schools and school districts will be talking to potential teachers on Wednesday (Oct. 10) during the Fall Teacher Job Fair. Recruiters from districts from Texas’s metropolitan areas, as well as smaller school districts and a few private schools, will be available, including Bryan, College Station, Conroe, Denton, Galena Park, Garland, Pasadena and Spring, among many others. In addition, agencies such as the GETCAP Head Start, the Consulate General of Japan, the Teacher Job Network, and Education Service Center Regions 4 and 6 will be available to discuss other employment possibilities, and the Texas Teachers Alternative Certification program will be at the fair to talk with non-education majors about potentially becoming a teacher. Ottis Hilburn, winner of numerous artistic awards, has paintings exhibited in Canada and Europe, as well as the United States, including, most recently, in the United Nations Cultural Center in Vienna, Austria. Beginning Sunday (Oct. 7), the SHSU alumnus will return to bring his talents to the campus to present his exhibit “Frontier Faces” in the Lowman Student Center Art Gallery. “Frontier Faces,” which will be presented through Oct. 21, is a new series of paintings, drawings, repoussé, and woodcarvings of Texas Rangers, prominent American Indians, and women of the west. Several of the pieces have already won awards in judged shows, and one critic called the series his “best work yet,” Hilburn said. Hilburn uses various media such as oil, watercolor, acrylic, and collage to express vibrant, artistic ideas and scenes. He finds inspiration to paint on subjects such as landscapes and a variety of people and places through his encounters and world-wide travels made with his wife, Bonnie, he said.